You can access the service from our main page (http://www.seomastering.com/), from TOP ratings (http://www.seomastering.com/site-value/) and from many other site pages. Here is an audit example (http://www.seomastering.com/audit/seomastering.com/). 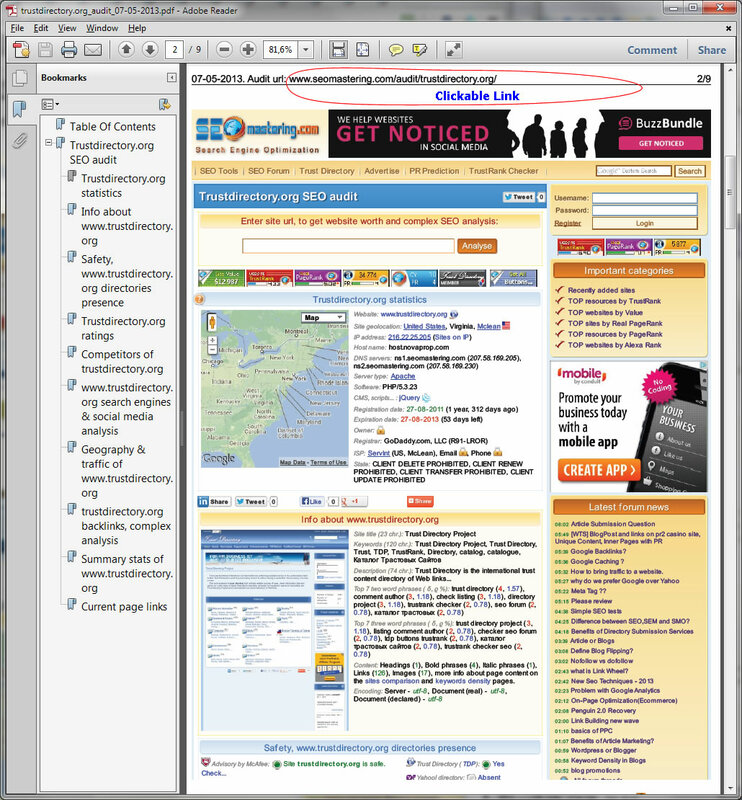 Visit, for example the home page of the site (http://www.seomastering.com/), enter your site address into the form and press the "Analyze" button. You can select button codes, placed on the Analysis page, or you can pick up (from several dozen) more suitable buttons on the widgets page (http://www.seomastering.com/informers.php). 0 - 10% (http://www.seomastering.com/scripts/cms_detector/apps/greencircle.png). Excellent. 10 - 20 % (http://www.seomastering.com/scripts/cms_detector/apps/greencircle.png). Good. 20 - 30 % (http://www.seomastering.com/scripts/cms_detector/apps/yellowcircle.png). Perhaps it's OK, but pay attention to the outgoing links. 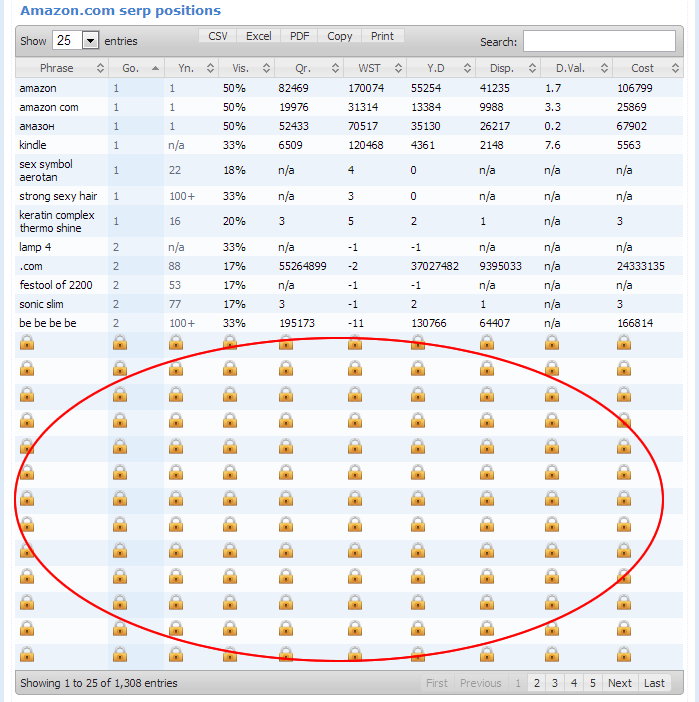 30 - 50 % (http://www.seomastering.com/scripts/cms_detector/apps/yellowcircle.png). Attention - maybe a lot of outgoing links. 50 - 80 % (http://www.seomastering.com/scripts/cms_detector/apps/redcircle.png). Bad - a lot of outgoing links. 80 - 100 % (http://www.seomastering.com/scripts/cms_detector/apps/redcircle.png). Very bad - too many outgoing links. XI. Widgets page (http://www.seomastering.com/informers.php) for placing them on your site. 6. Presence in the Trust Directory (http://www.trustdirectory.org/) (if listed, or it can be added). 2) TOP by site value (http://www.seomastering.com/site-value/). 3) TOP by TrustRank (http://www.seomastering.com/trust-rank/). 4) Top by Real PageRank (http://www.seomastering.com/real-pagerank/). 5) Top by Alexa Rank (http://www.seomastering.com/alexa-rank/). 6) Top by PageRank (http://www.seomastering.com/pagerank/). 7) Top by CY (http://www.seomastering.com/tic/). 8 ) Top CMS (http://www.seomastering.com/cms/). 13) Top based on IPs (http://www.seomastering.com/ip/). Because the service cannot connect to the site. Fast and very comfortable. Thanks !-! What means the value -1 ? First off I'd like to say thank you for providing such an awesome SEO tool. The tool uses WhoIs services. Is there a way to run a report from scratch to gather the latest information regarding a domain? Some data are collected, other not. You can see the following historical graphs: PageRank/Real PR/TrustRank/CY/Site Value. If you mean the latest data, you always see it. The url of domain's audit is permanent. So, you can always see the last gathered data. The tool allows to get new data no more than one time in 44 hours. The rest time you see saved data. Adrianm, please give your site url. I have just tried to audit your site. Without problem. Here it is (http://www.seomastering.com/audit/syspoly.in/). What is Site spammy links..??? How it calculating..?? 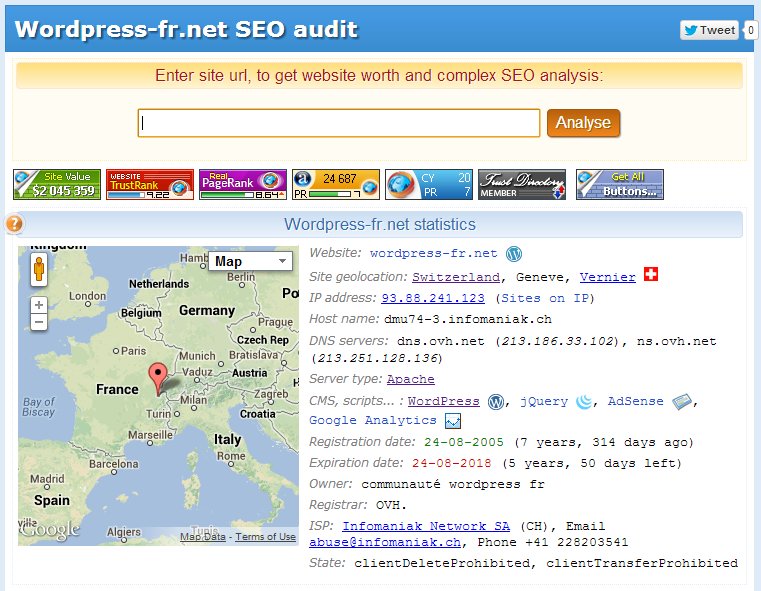 This is from far one of the greatest tools i've used in the SEO area, congrats for this effort! !-! !-! !-! 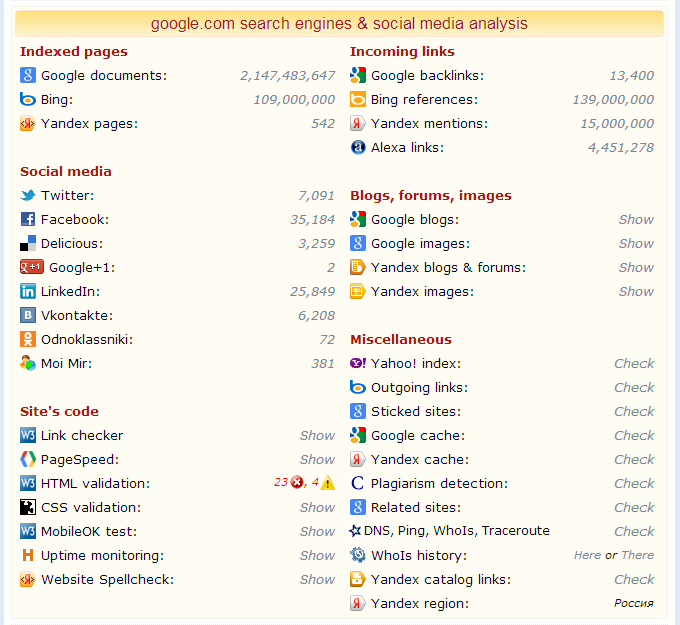 Has some different features compared to other SEO analysis tools out there, bookmarked it thanks! Thanks for the great seo tool and information. 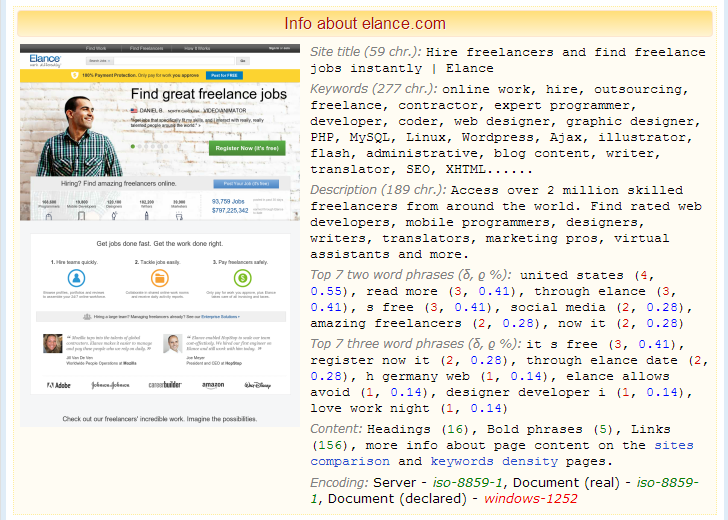 Your report is a great way to examine a website, but I see some locks on some parts of the report. 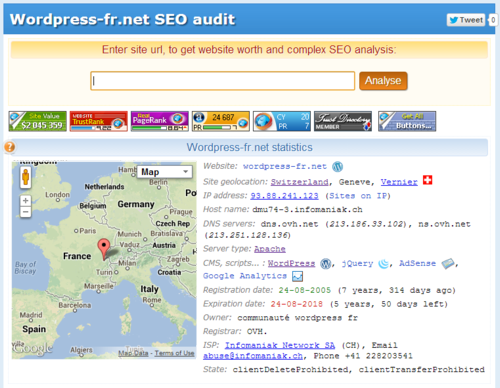 Thanks for the post which contain imp SEO tools for SEO optimizer to get site rank. The device is awesome, anyway I figure the # of guests that this apparatus exhibits isn't near the real world. I have diverse numbers from google investigation and far less number from search engine optimization acing. May be somebody can investigate that.